MAYU Water [Review] - Worth it? 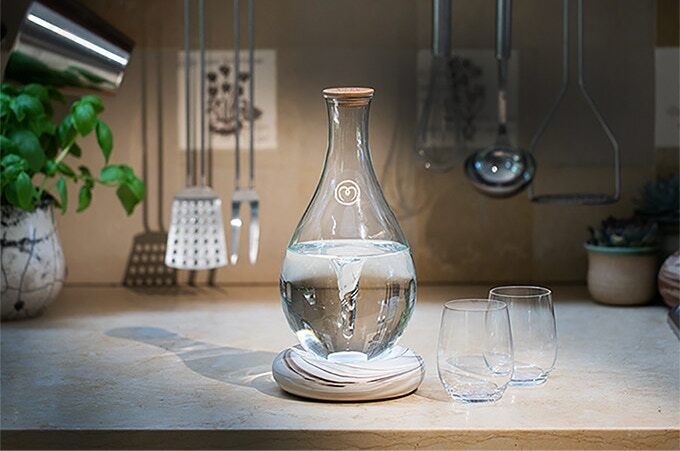 The Mayu water aeration system uses a glass pitcher that sits on top of a magnetic base with a motor inside it that stirs the water up, using a natural swirling motion to aerate it. In this article, we are gonna be analyzing MAYU and its campaign, so you will be able to know if it’s worth-a-buy. The principle behind this product goes down to the swirling pattern. When water sits and doesn’t flow, it develops germs and pathogens that affect its taste and make it unhealthy. When it moves around, oxygenation occurs and starts chemical reactions that remove foreign chemicals and substances in the water. This is the basis for Mayu. They claim that their aeration system helps to evaporate chlorine and toxins in the water, while also improving its taste and texture. But, there are a few flaws with the system that they really aren’t addressing. Review and discussion – Do you really need MAYU? The first thing that you need to know is that aeration itself can’t filter the water. The company recommends that you use filtered water in the Mayu device. Why? Well, even with all of their claims about how many contaminants and toxins that the aeration will remove, no one type of filtration removes it all. This is why most filters use multiple mediums to filter water. However, Mayu doesn’t state that you should use filtered water on the campaign page, only in the comments. So, unless you did a deep dive in the comments like I did, or you researched the science behind water filtration and aeration, you’d never know. Furthermore, there is a lot of cheaper option like this one on Amazon. The Mayu comes with a cap to store the water after you swirl and aerate it. But, you have to swirl the water, uncapped, for the aeration to work. Otherwise, you’re neither removing anything from the water that’s in the pitcher, nor adding anything to it. This isn’t stated on the campaign page, either. The system uses a silicon-coating in the pitcher, which breaks down and will be non-existent after a few years, depending on how much you use it. This means that the coating breaks down and gets in your water, contaminating it. When asked why they didn’t use a ceramic coating instead, they said that the ceramics made a swishing noise, while the silicon prevents it. That seems like an odd decision, given that they market the product to give you healthier, less contaminated drinking water. Rocks are a natural form of filtration, so ceramics would be more natural than silicon and cause no contamination. And, lots of people pay for noise machines that produce sounds that mimic water flowing over rocks, so that gentle swishing noise doesn’t seem like a bad thing. There’s no way to cool the water included in the system, either. You can boil your water and then put it in the Mayu vessel. Aeration will get it to room temperature faster than leaving still water out to cool will. But, the fact that there’s no way to cool it creates problems. When asked if freezing water that has been aerated with the Mayu would produce ice cubes that are as beneficial as aerated Mayu water, the company stated that it depends on your freezer environment. They suggest storing the ice in an airtight container. This means that you can aerate it and detoxify it all you want, but those effects will be negated by your freezer. This is a fairly big flaw. You cannot simply put water from your tap into the vessel, aerate it and have cool, aerated water. If you do this, then put it in your refrigerator to cool it off, you’ll negate any of the beneficial qualities that the Mayu gives the water. You have two options: aerate again after refrigeration, or refrigerate before aeration. And, if your water can pick up contaminants from your refrigerator and environment, even though it’s been aerated, doesn’t that mean you should filter it, aerate it, then filter it again? And, if so, what’s the point of the aeration? So, if you do decide to back the Mayu, understand that this isn’t a water filtration system, no matter what health claims they make. You still need to filter your water. And, it most likely only makes the water taste better and have an improved texture. I’m not sure I would spend $90 to improve my water’s texture, mostly because water texture has never been a top priority for me, however. Anyway, it’s your choice to decide. Below is the link to the campaign page, grab one earlier for a discount. MAYU Water - Drinking aerated water with a flowing whirlpool. This campaign is running on Kickstarter until Thu, December 13 2018.